The "business" of practice as a mental health professional is a skill that is seldom taught in school and requires thoughtful guidance and professional mentorship from those who have already succeeded. Containing the collective wisdom and secrets of many expert practitioners, this helpful resource provides useful insights for setting up, managing, and marketing your practice, including timely advice on being a successful provider in the digital age—from Internet marketing to building your online presence. 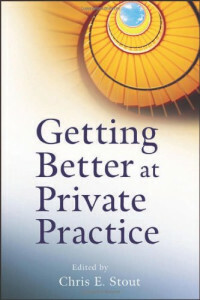 Full of action-oriented ideas, tips, and techniques, Getting Better at Private Practice provides both early career and seasoned mental health professionals with the knowledge and tools they need to establish, develop, and position their practice so that it is financially successful and life-enriching over the long term. Stop guessing, start testing, and enjoy greater success with your website.